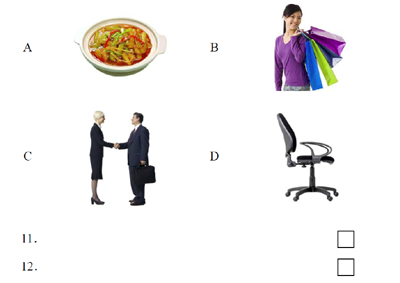 1-10: The first 10 questions require you to listen to a tune twice and then determine whether the picture is right or wrong, in other words has something to do with the text you heard or not. 11-20: Question 11-20 confront with you some pictures (more than on the picture above) and 5 questions (x2) and you need to enter the letter where the picture fits best with what you hear. 31-35: And the final 5 questions, which are similar to part three, just maybe a little bit more difficult. 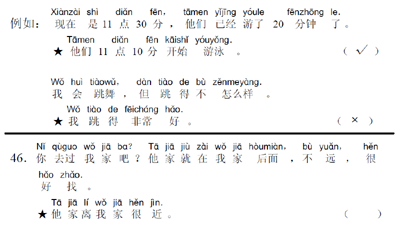 36-40: The first reading part gives you some pictures (more than on the picture above) and 5 answers, and you need to put in the letter of the picture fitting best to the sentence. 41-45: At questions 41-45 you have some words with capital letters in front of them and you need to put them into the gaps of the sentences as shown in the graphic. 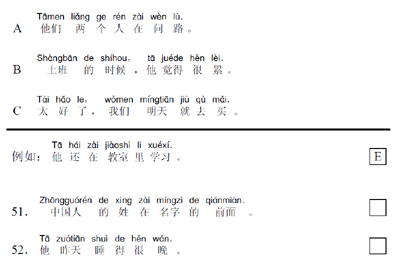 46-50: Part three confronts you with a short text and a statement, depending on whether this statement is right or wrong, you need to fill in the blank on the right accordingly. 51-60: The last 10 questions require you to match the sentences on the top with the sentences on the bottom by filling in the correct letter on the right. The maximum score for this test is 200 with 120 required to pass. There are 100 points for listening and 100 points for reading. 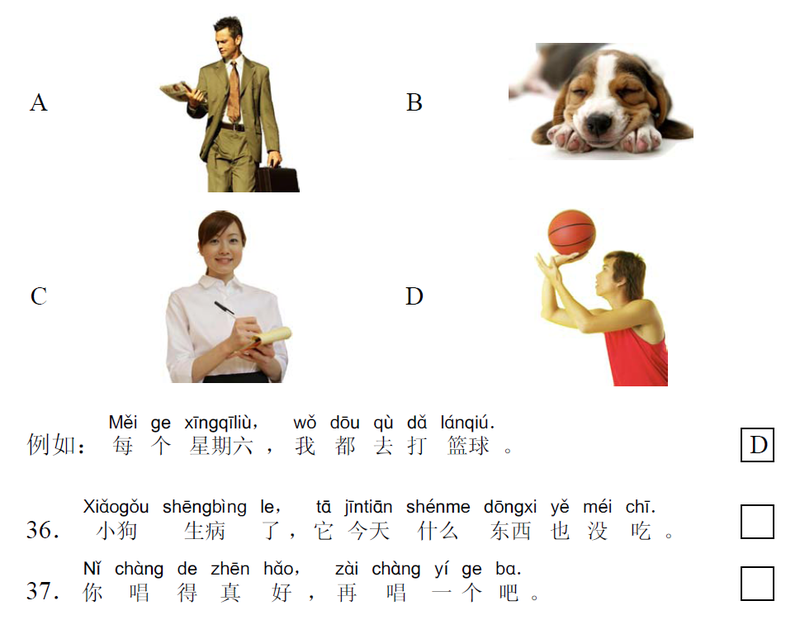 The sample pictures above as well as the information where taken from chinaeducenter.com. On this website you can find further information, the outline of the 300 vocabularies as well as a mock test with mp3 needed for the listening (as part of the outline vocabulary download package). Have a look at this, it might be very helpful in the course of preparing for the test.